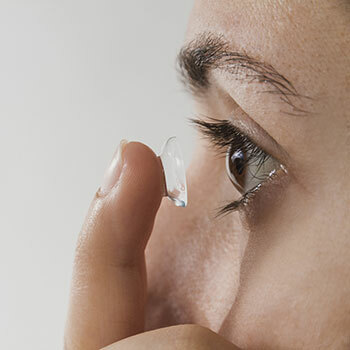 Contact lens aftercare is essential to ensure healthy eyes, to protect your sight and ensure comfortable and enduring enjoyment of your lenses. Contact lenses are completely different from glasses. Placed directly upon the eye they impact upon the metabolism of the cornea and have the potential, if abused, to damage sight through overwear, trauma or infection. For this reason aftercare appointments are advised at least once a year and preferably every six months and at any time there is discomfort or change in sight. At A & C opticians this is all covered under our Eyeplan care scheme that also offers free contact lens fitting and refitting, covers all sight tests and provides discounts on contacts lenses, glasses and accessories. During aftercare appointments we check the condition, fit, type and prescription of the contact lenses for continued suitability and we also carefully examine the impact of the lenses upon health of the front surfaces of the eyes and the eyelids and the quality of tear coverage over the lens and cornea. We discuss any problems and advise on solutions that may improve length of wear, comfort and sight in relation to your occupation, hobbies and leisure pursuits. Or at any time there is discomfort or change in sight.